The number of ladder falls continues to increase accounting for almost 20 percent of all fall injuries at work. Falls remain a leading cause of death from unintentional injury according to the CDC. Many of the injuries and deaths caused by ladder falls could be prevented through ladder safety training and by implementing a ladder safety program. Who is At Risk of Falling from Ladders? Construction workers are the greatest risk of injury and death from falls from elevation. Almost 81 percent of construction fall injuries treated in emergency rooms involved the use of a ladder. In 2016, about 370 of the 991 construction fatalities were caused by falls from elevation. But ladder falls also occur often in the mining, maintenance and repair industries. Most workers who fall from ladders are male, older and Hispanic. The most common types of work injuries from ladder falls include fractures, strains, sprains, and tears. The average number of days lost to a fall on the job site is about 12 days. Each May, OSHA and the National Safety Council promote their National Safety Stand-Down program. Employers and workers across the country participate in this program. It was designed to raise awareness about how to prevent fall hazards in the construction industry. Inspect the ladder for signs of cracking/splinter if wood, warped or twisted steps if metal, or any loose screws, rungs or hinges. Clean dirt, oil, and grease that may be on the ladder. Wear a helmet and shoes with slip-resistant soles when using a ladder. Always maintain three points of contact with the ladder at all times. Have a co-worker stand at the ladder base to brace it. 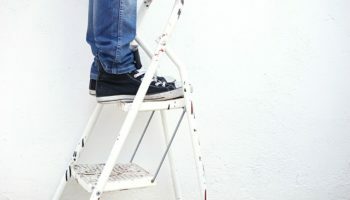 Workers who have been drinking alcohol or have a medical condition that could cause fainting or dizziness should avoid using a ladder whenever possible to prevent falls. Older workers should also be discouraged from using ladders to reduce workplace injury risks. OSHA provides its information for ladder safety in 29 CFR 1926 Subpart X. Included in this standard are standards for portable ladders, including both self and non-self-supporting types.